Today, I traveled to a mall a little further into town. I was not greeted by the same sea of sweatpants as I was yesterday; however, everyone still looked pretty much the same. The style level started to increase as I entered Neiman Marcus. I spotted her shoes as I rode down to their level on the escalator. 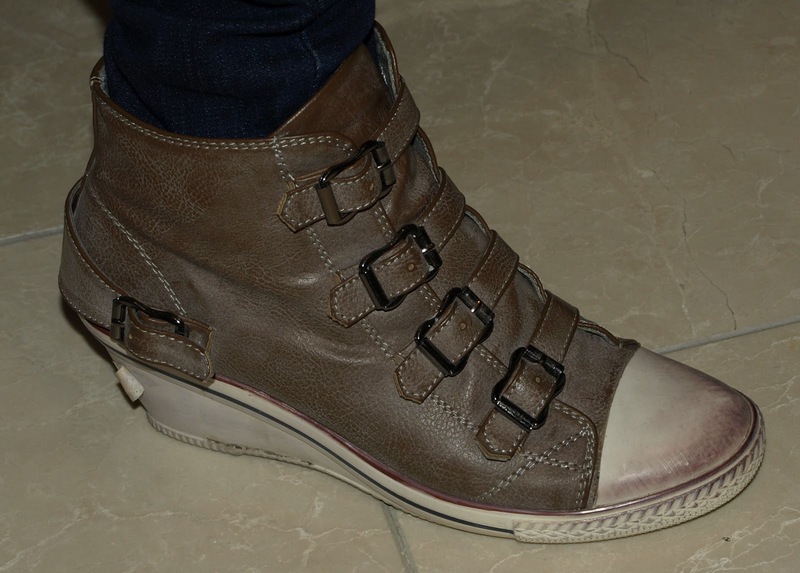 They are super cool and practical - a wedge sneaker. She said she bought them overseas - "cheap". Of course. The only place I could find this exact shoe was on Amazon.com where there are only a few sizes left. (It is called the Ash Women's Genial Fashion Sneaker in Fango.) NeimanMarcus.com carries a similar shoe in gray. Then I ran across the first stylish caucasian that I have seen in two days. She was also wearing great shoes - wedge Mary Janes. She said they are Christian Louboutin from a few seasons ago. I found a lot of similar looking shoes on the internet, but few are crafted like these. You have to be careful not to stray into granny territory. A more casual, summer version can be found in the following Bettye Muller espadrilles on Endless.com. But seriously, where are the rest of the stylish white people? Next week, I will be traveling even further into the city to find some.